Blackberry is a well-known and widely consumed fruit that boasts medicinal properties as well as versatile culinary applications. The blackberry fruit, also known as bramble, or brambleberry, has been valued since ancient times for both their culinary and medicinal properties. Because blackberries grow wild throughout the world, they have retained their popularity in many different cultures. Supporting brain function. Thanks to their antioxidant properties, blackberries boost memory and cognition, thus preventing age-related diseases, such as dementia and Alzheimer. Boosting immunity. Blackberries strength cell metabolism, which shields the body against damaging free radicals and potentially harmful pathogens. Promoting gastrointestinal health. The consumption of blackberries encourages good bacterial growth, which helps with the treatment of diarrhea and improves digestion. Additionally, blackberries are a good source of fiber, which naturally helps regulate blood sugar. Blackberry is abundant in phenolic compounds, mainly anthocyanin, a powerful antioxidant, which is responsible for the fruit's dark hue, and ellagic acid, which helps prevent inflammation and cellular deterioration. Both antioxidant compounds work reducing the proliferation of reactive oxygen species in cells, preventing mutations and dead due to oxidative stress. This mechanism of action not improves immune responses against diseases, but has also shown neuroprotective effects. In addition, the presence of tannins allow for the astringent properties of blackberries, which help in the treatment of diarrhea and normalize digestive functions. Acai and blueberry also possess antioxidant properties, whereas tomato and pineapple provide similar anti-inflammatory benefits. Blackberry is considered generally safe for consumption; however, it may trigger unfavorable reactions in people allergic to Rosaceae species, causing anaphylaxis in rare cases. Over consumption of blackberry may cause adverse reactions, such as stomach discomfort, nausea, and vomiting. While in dietary amounts the tannins in blackberry are considered harmless, people with a history of degenerative diseases, such as cancer, as well as the ones with chronic gastrointestinal conditions, should seek the advise of a health care professional before consuming the leaves and roots of blackberry in medicinal doses. Blackberry fruits are considered safe for everyone to consume; however, women who are pregnant and breastfeeding, as well as children under two years old should avoid blackberry leaf tea. Blackberries are particularly rich in dietary fiber and manganese, an essential mineral that helps with the formation of bones and connective tissue, as well as with blood clotting and the well-functioning of the endocrine system. They also provide good amounts of copper, which works with iron to help produce red blood cells as well as promoting the health of blood vessels, nerves, immune system, and bones. As other berries, the blackberry fruit is a great source of vitamin C (ascorbic acid), which enhances immunity, thus contributing to shield the human body against harmful pathogens and degenerative diseases. It also provides good amounts of vitamin K, necessary for proper coagulation, and smaller quantities of many other nutrients, including vitamins E, folate (folic acid) and most members of the B-complex group, along with minerals like zinc and magnesium. 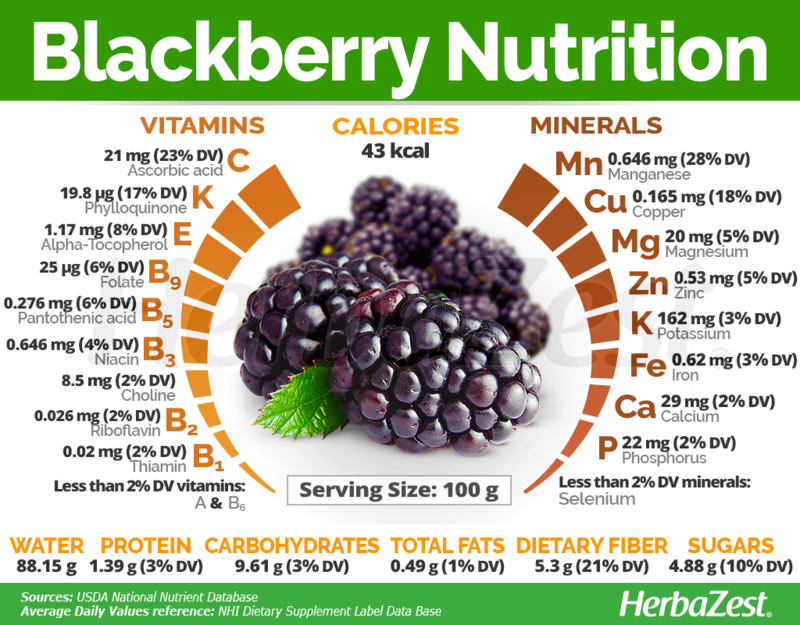 100 grams of fresh blackberries provide 43 calories and 21% of the recommended daily value for dietary fiber. For centuries, blackberries have been valued by many different cultures as a way to enhance the flavor and smell of all types of meals. However, for medicinal purposes, blackberries can be taken as a supplement or as herbal remedies. Raw. Although it is widely used as an ingredient in many cooked meals, blackberries are also popularly consumed raw. They can be used as a garnish or an addition to a variety of sweet and savory dishes. Cooked. Blackberries are commonly used in jams, pies, and desserts due to their natural sweetness; however, they are also used to flavor alcoholic beverages, such as wine and brandy. Juice. Fresh, frozen, or dried and powdered blackberries can be made into juices and smoothies, alone or mixed with other fruits. Powder. This is popular form of consumption, with a longer shelf-life, and can be mixed with shakes and other beverages. Liquid extract. This preparation concentrates the natural properties of the herb. 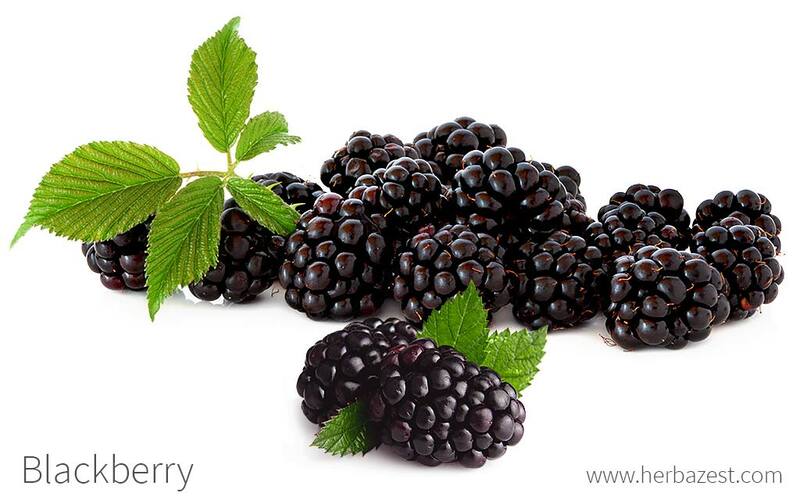 Few daily drops diluted in a glass of water can bring all the benefits of blackberries. Capsules. 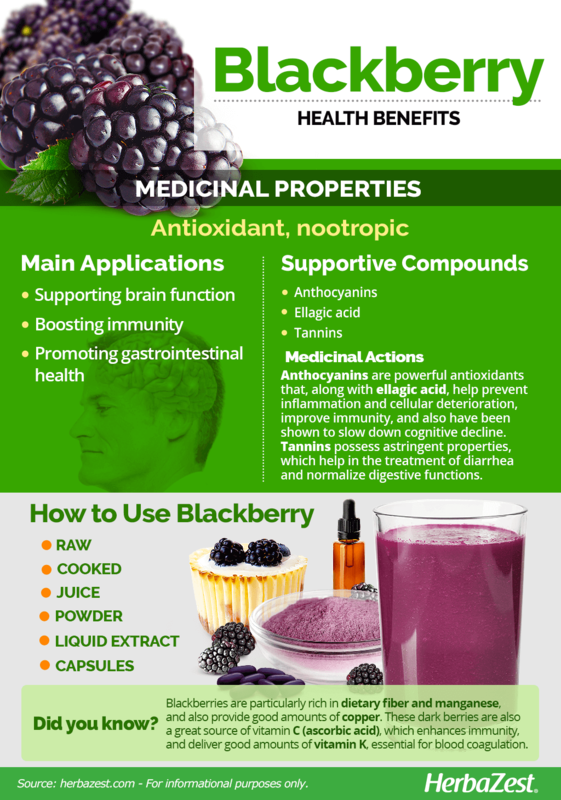 The antioxidant power of blackberries can be obtained in standardized, daily doses. Fresh blackberry is available year round in most supermarkets. Although its is mostly bought fresh, other forms are also available, such as frozen berries and powder, which can also be purchased online. Blackberries are imported from Mexico to the United States and Europe during the off-season, so they remain available all year-round, either in fresh form or as jam and juice. 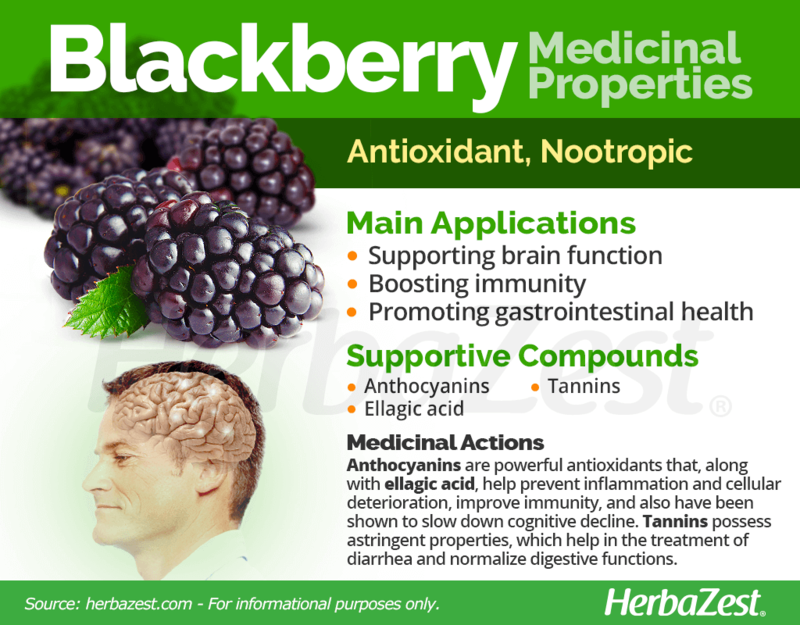 Blackberry supplements are mainly found in specialized health stores. In addition, there is a wide variety of blackberry products available through online retailers. 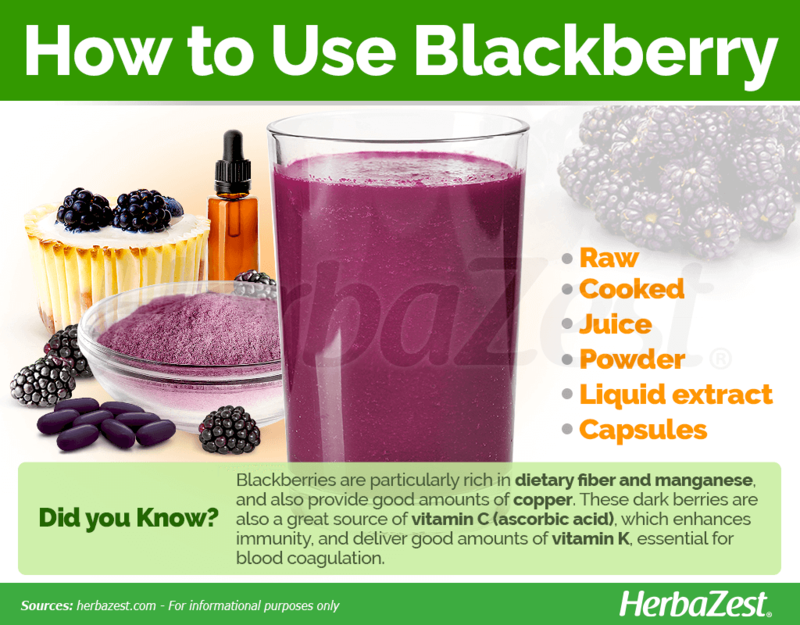 Blackberry supplements are made from the fruit and leaves of the blackberry plant most commonly. However, they can also be found made with the juice of the fruit. Because of the different ways in which the supplements can be produced, it is important to research the content of any supplement. It is also a good idea to consult a medical expert before deciding to take blackberry in medicinal doses. Blackberry is very adaptable to its surroundings, and grows wild on many continents throughout the world. In fact, in some regions, it is even considered a weed. However, when it comes to commercial cultivars, it is important to consider the specific type of blackberry being grown. Erect blackberry shrubs require less spacing (as little as 10 feet, or about 3 m, between each shrub) but fairly regular formation pruning; semi-erect and trailing cultivars will require 16 - 26 feet (approx. 5 - 8 m) between each plant in addition to training to conduct growth. In order for blackberry to reach its maximum potential, it should be planted in sandy, acidic soil in a spot which is exposed to full sun. It is preferable for the soil to have a pH of 5.5 - 7.0. Deep watering will prevent soil from drying out. Blackberries prefer warm, temperate climates and are vulnerable to frosts. They are also quite vulnerable to viral infestations, so it's strongly encouraged to keep blackberry plantations far away from wild blackberry shrubs. The blackberry fruit has a torus that stays with the fruit, which is what differentiates it from raspberries and brambles, relatives in the same genus. The fruit is not a true berry; it is instead an aggregated fruit. The leaves are three or five compound oval leaflets, and the white or pink flowers of the plant are 0.75 - 1.2 inches (2 - 3 cm) in diameter. Blackberry is a member of the Rosaceae family, which contains about 2,830 species spread out over 95 genera. Other well-known members of the Rosaceae family are almond (Prunus dulcis), apple (Malus domestica), pear (Pyrus communis), prune (Prunus domestica), and strawberry (Fragaria x ananassa). Blackberry is also a member of the genus Rubus, which comprises a wide variety of evergreen and deciduous shrubs. It includes 12 recognized subgenera, many of which have hundreds of species. Raspberry (R. idaeus), and blackberry (R.eubatus), are among the most popular species of Rubus cultivated for their edible berries. On the other hand, R. coreanus and R. hirsutus are mostly used in Chinese traditional medicine, while R. ursinos has been traditionally consumed by Native Americans to treat swellings and sores. For millennia, blackberry has grown wild on the Earth and dozens of varieties have appeared naturally. As a result, there are many types of blackberries nowadays. Because of the blackberry's ability to crossbreed with ease, there are numerous cultivars that have been created and introduced for commercial and amateur cultivation, both in Europe and in the United States, such as the long-standing 'Brazos' and 'Cherokee', or the newer 'Black Satin' variety. Prickle-free cultivars, which facilitate processing of the fruit, have been developed throughout the world, including the 'Black Diamond' and 'Nightfall' cultivars. The blackberry plant is an ancient species that have existed for over 30 million years. It is unclear whether it originated in Asia, Europe, North America, or South America. However, it is known that Ancient Greeks used the blackberry fruit to alleviate the symptoms of gout, while the Romans favored the leaves to treat various ailments. Egyptians used the berries as hair dye due to the effectiveness of their dark color, and so did Native Americans for food, medicine, wine making, and to dye animal skins. Mexico is currently the biggest producer of blackberries, with most of their produce being exported to North America and Europe during the off-season. Oregon is the biggest blackberry-producing state in the United States, with over 56.1 million pounds (25.4 million kg) of blackberries cultivated over 7,000 acres in 2009. The United Kingdom, Chile, and New Zealand are also producers. Blackberries crossbreed with each other easily, and so many have been artificially cultivated to increase their yield and value. Dye. Historically, the berries have been used as a dye for both hair and materials. Wine. The blackberry vines and twigs have been historically used as flavoring agents in the wine industry. Cosmetics. Extracts of blackberry are also added to some cosmetics for color or aroma.